Nebraska's Michael Sealy (left) and Prahalada Rao stand next to a new 3-D printer in the Nebraska Engineering Additive Technology Labs. A new lab space places Nebraska Engineering on the cutting edge of 3-D printing capabilities. The Nebraska Engineering Additive Technology Labs feature three hybrid printers that can add or subtract a variety of materials — from plastics to titanium — to create complex three-dimensional designs. “This is incredibly rare, unique equipment that we’re now able to access,” said Michael Sealy, assistant professor of mechanical and materials engineering. Located in the University of Nebraska–Lincoln’s Scott Engineering Center, the lab allows Husker researchers and students to create projects using highly reactive materials. This process accommodates for creation of intricate geometries, such as lattice structures and complex internal cooling channels for aerospace applications. 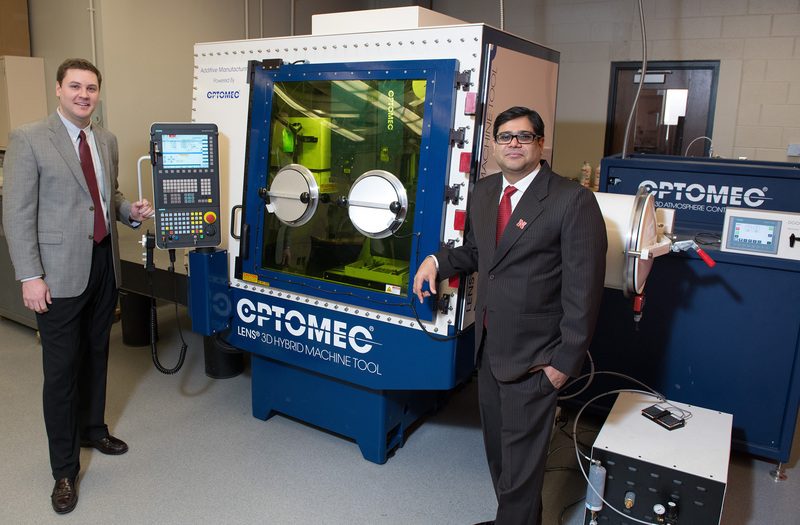 The printing possibilities could transform many industries, especially paired with the quality control systems development research of Prahalada Rao, assistant professor of mechanical and materials engineering and recent winner of a National Science Foundation CAREER Award. "Nebraska is positioning itself as a hub for additive manufacturing in a variety of industries, including agricultural equipment, manufacturing and biomedical," Rao said. "If this research is successful, it will have a huge impact on how quickly and reliably we can turn around new products and designs, spurring innovation in Nebraska." Sealy said students are also excited about getting to use the printers. Also, a new additive manufacturing course, which will be taught by Sealy and Rao, has been added to take advantage of the new technology. The NEAT Labs will be featured in a May 17 open house during the Great Plains Additive Manufacturing Symposium. The open house, which is free and open to the public, is 3:30 to 5 p.m. in 126 Scott Engineering Center. The symposium is 8 a.m. to 3:30 p.m. and features presentations by experts from the Boeing Company, National Institute of Standards and Technology, Edison Welding Institute, National Nuclear Security Administration-Kansas City campus, Air Force Research Laboratory, America Makes and Navajo Technical University. Registration for the symposium is open through May 12. Costs are $100 for participants from outside the University of Nebraska system, $50 for students not enrolled at Nebraska, and $40 for NU faculty, staff and students.